Huawei recently released an attractive-looking Windows 10 hybrid tablet, but how well does the Matebook compete with the current enterprise favorite, the Surface Pro 4? The Surface Pro 4 is the result of years of fine-tuning on Microsoft's part, and it's come a long way since the first iteration of the hybrid device. Now that hybrids have hit their stride in the market, other manufacturers are following suit. 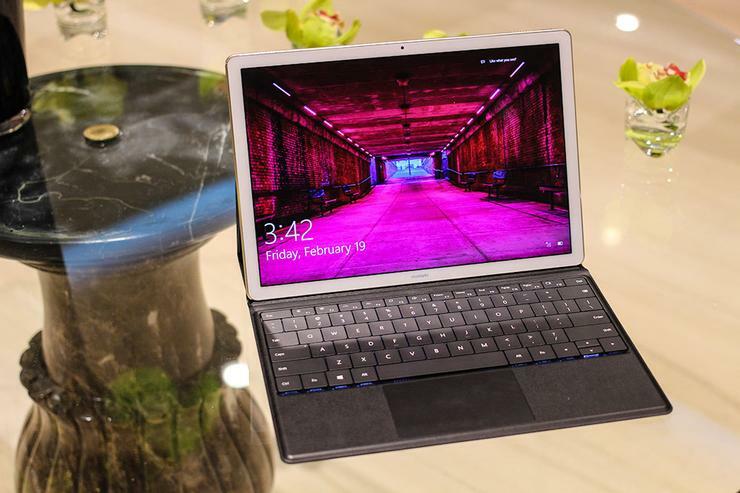 We've seen the release of the iPad Pro, the Samsung Galaxy TabPro S and, most recently, the Huawei Matebook -- all devices aimed at swaying business users away from traditional notebooks. Huawei is mostly known for smartphones -- not so much in the U.S., but the company has gained a significant amount of the market in other regions. The Matebook is one of Huawei's first attempts at offering a hybrid tablet aimed at business users. It's an attractive and well-made device, but how well does it compete with the Surface Pro 4? A keyboard can make or break a hybrid device. To use the tablet as a traditional notebook, you expect a similar level of usability and convenience. Unfortunately, this is definitely an area where the Matebook falls flat. While it's similar in design to the Galaxy TabPro S and iPad Pro, where the keyboard acts as a dock and stand for the device, but it's far less sturdy than the competition. The Matebook's keyboard design is flimsy, and it's too easy for the display to slip right out of the dock -- which could end up with a broken device. The keys themselves feel mushy with shallow travel, and they're placed too close together, which increases the amount of typing errors. Ultimately, the keyboard on the Matebook feels like an afterthought. The Surface Pro 4 has completely different design -- the keyboard isn't meant to support the device. Instead, you make use of a kickstand on the tablet to adjust viewing angles and to keep the display upright. It's far more convenient, and sturdier, than the portfolio design of the Matebook. It's also a nice feature if you decide to use the device as a tablet, because if you remove the keyboard -- you won't need anything else to keep the display upright. All-in-all, the Surface Pro 4 keyboard and kickstand offer more stability and makes it easier to use in cramped spaces (e.g., on a train or a plane). The keyboard is also comfortable to type on, and won't require much adjustment from your typical notebook or desktop keyboard. The Surface Pro 4 definitely wins in this category. Ports may not be a huge concern for the typical consumer, but for a business user, a hybrid tablet needs to offer a wide array of ports. The Huawei Matebook went the way of the iPad Pro and Galaxy TabPro S by including just one USB Type-C port that also acts as the device's power source. That doesn't leave much room for USB sticks, HDMI connectivity or for extended peripherals such as a wireless mouse, keyboard or external display. Huawei does offer a docking station that expands the device to include two USB 3.0 ports, a VGA port, an HDMI port and a USB Type-C port. However, it's just another piece of equipment you'll need to remember to pack every time you take your device somewhere. The dock adds another $89 to the overall price. The Surface Pro 4 also has a compatible dock, but the device itself has enough ports to get you through the day without opting for the dock. It includes a USB 3.0 port, a MicroSD card slot and a mini DisplayPort. If you need some on-board ports, and you don't want to carry around adapters and a docking station, you'll want to opt for the Surface Pro 4. The Matebook offers two options for processors and memory -- you can opt for either an Intel m3 or m5 processor and 4GB or 8GB of RAM. Naturally, if you opt for the Intel m5 with 8GB of RAM, it's going to perform better than the lower end options. However, the configurations aren't on par with the Surface Pro 4 which has multiple configurations, ranging from an Intel m3 mobile processor all the way up to an Intel Core i7. The real dig comes down to the amount of performance for the price. You'll need to shell out around $1,100 for the highest Matebook configuration, with the Intel m5 mobile processor and 8 GB of RAM. For around the same price, possibly a little less depending on where you purchase it, you can get a Surface Pro 4 with an Intel Core i5 processor and 8GB of Ram. It's hard to rationalize spending the same amount on a device with lower performance, which means the Surface Pro 4 wins in this category. Huawei did not skimp on the design of the Matebook and it's actually more attractive than the Surface Pro 4. They're both high-quality builds, each featuring an aluminum chassis, but the Matebook does have a more modern and sleeker design than the Surface Pro 4. It also doesn't help that Microsoft has -- for the most part -- left body of the Surface Pro mostly unchanged over the years. In contrast to the more tired design of the Surface Pro 4, the Matebook is an eye catching device. The Matebook is a great option if you want an iPad Pro lookalike running Windows 10 instead of iOS.